MILAN, ITALY--(Marketwired - Jul 28, 2015) - In a city known for fashion and culture, it's only fitting that the traditional business meeting is undergoing a makeover. And the Milan Marriott Hotel is at the forefront of the transformation. Embracing Marriott's concept of "Meetings Imagined," this Milan business hotel is taking a different approach to working with meeting planners, and it's one that begins with people. The idea behind "Meetings Imagined" is to create meetings that are as meaningful as they are effective. So where meeting planners may have previously only had to supply the number of delegates and ideal dates for a conference in order to choose a package deal, now they can work one-on-one with event-planning staff at this hotel in Milan, Italy to describe their meeting's objective, the nature of their business and how to integrate those things into a seamless, impactful event. Event planners do more than talk, however. In a reflection of the changing way people do business today, hotel associates and meeting planners can utilize an exciting new digital platform to brainstorm ideas for their conference. The website offers inspiration through diverse images, like one of tables laden with colored pencils and paper; or one of Technogym Wellness Balls turned into boardroom seating. There's an image of a break set up in the fitness center with healthy snacks on offer, and there's a shot of desks equipped with writeable surfaces. Seating arrangements, table-scaping, drinks, décor and more are all highlighted on the platform as well. Event organizers can also choose from some of the most inspired meeting rooms in Milan at this business hotel. The 22 function rooms range from daylight-infused venues for board meetings, to a sweeping ballroom that accommodates up to 1,400 people. Modern technology (including Wi-Fi and A/V services) and a full-service business center further enhance the quality of each event. Between the unprecedented planning approach of "Meetings Imagined" and its impressive functionality of space, the Milan Marriott Hotel is positioned to reinvent meetings for today's groups. And that's a makeover that rivals anything on the runways. As one of the preeminent business hotels in Milan, the Milan Marriott Hotel welcomes travelers into the heart of Milan with flexible meeting spaces, spacious guestrooms and an enviable address. A sumptuous lobby sets the tone for the accommodations, which are richly appointed with marble bathroom floors, spacious work areas and luxurious Revive bedding. Executive Level rooms afford additional amenities and access to the inviting Executive Lounge with complimentary breakfast. Other tantalizing dining options include La Brasserie de Milan Restaurant, whose open kitchen specializes in fresh Mediterranean fare, and the casual Bar 66. A fitness center and business center encourages guests to stick to their routines while traveling. And the hotel's convenient access to the airport complements its 24,757 square feet of event space for business travelers. Those arriving on holiday, meanwhile, will find themselves just steps from the Duomo, as well as top museums, shops and restaurants. 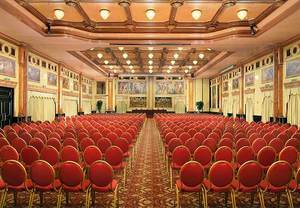 Our Milan hotel is ideal for hosting successful meetings and events.